Venture Architects developed a space needs analysis and site options for a new sports arena on the Madison campus. The study tested alternatives for basketball, hockey, concert performances and other large assemblies. 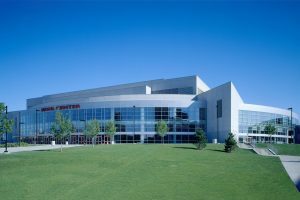 Subsequently engaged to deliver fast-track design services for the facility, the architectural team established benchmarks of 16,000 seats for Basketball and 15,000 seats for hockey events. In addition to the general seating, the facility is ringed with luxury boxes and a large open club seating area. A major priority of the UW athletic department was to keep fans close to the action and the tiered stadium seating accommodates this goal. The arena also has an additional gymnasium and fitness area which are utilized as practice facilities. The facility opened to a capacity crowd for a men’s basketball game in January of 1998. Services Provided: Program Generation, Schematic Design, Full Architectural Documentation, Interior Design, Structural Engineering, Lighting Design and Landscape Architecture.